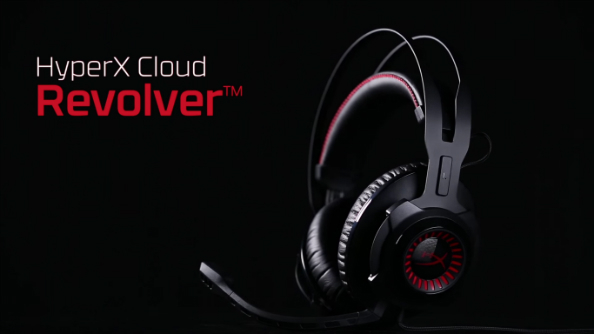 Only in the worlds of PC gaming and high school band names could you string the worlds ‘HyperX Cloud Revolver’ together without raising an eyebrow. Unsurprisingly for anyone who’s been following the trajectory of Kingston offshoot HyperX thus far, they’ve opted to release a new gaming headset rather than a 2-song EP full of thinly veiled disses aimed at their exes, played in drop-C tuning. Want some booming artillery explosions to test out the bass on your cans? The best WW2 games on PC will do the job. The Cloud Revolver headset is now available for pre-order from 1st April and ships 9th May, promising a “studio grade sound stage” which “provides more precise gameplay.” The 50mm drivers found in previous Cloud models are refined and repositioned, and there’s a big departure in overall visual design. There’s now a big steel frame above the headband, and an additional bit of HyperX branding stuck on each earcup – it looks a bit like someone welded a Plantronics RIG control box onto each earcup of the older model Cloud. As many will already know, the Cloud I and II were absolutely stellar products – in fact the latter remains top pick in our best gaming headset guide. They both offered a triple threat of comfort, great sound, and great looks, the latter refreshing its older brother by adding a USB input and surround sound. What’s more, retailing at less than $90 it simply outstripped the competition in any useful category. It’s worth noting that both the Cloud and Cloud II were based around QPad’s QH-90 design, which Kingston bought the rights to. This newest model of Cloud represents the company going it alone after the success it generated using the QH-90 blueprint. Studio-grade sound stage: HyperX Cloud Revolver has a wider audio range that creates depth and width for optimal audio precision and a competitive edge. You’ll hear your opponents’ location more accurately from further away. Its larger sound stage is ideal for FPS and open environment gameplay and for a concert hall-like experience when listening to music. Next-generation directional 50mm drivers: Refined 50mm directional drivers are positioned parallel to the ears for a clean, crisp sound with enhanced bass. The drivers direct the sound into the ear for precise audio positioning. Signature HyperX award-winning memory foam: Red memory foam is visible from back of the ear cups to differentiate HyperX from its competitors. The higher quality, dense foam signifies HyperX award winning comfort and quality while providing ultimate comfort during prolonged gaming sessions. 2M audio control box extension with stereo and mic plugs: HyperX Cloud Revolver comes with a 2 meter audio control box extension with stereo and mic plugs for PC. It’s ideal for use with the on-board sound card. Durable steel frame: Designed in Germany, HyperX Cloud Revolver has a solid-steel frame for long-lasting durability and stability. Detachable noise-cancellation microphone: The removable microphone boom makes it easy to plug in for gaming or unplug to listen to music. It features a flexible design and custom mic positioning. Multi-platform compatibility: HyperX Cloud Revolver is compatible with PC, Xbox One™1, PS4™, Wii U™, Mac® and Mobile2 so you can use one headset for PC and console gaming. TeamSpeak certified: TeamSpeak™ certifies the voice quality to be clear and crisp with excellent sound quality. No audible echoes, background noises or voice distortions were detected in tests. Other compatible chat clients include Discord, Skype™, Ventrilo, Mumble and RaidCall. You can find out more about the Cloud Revolver and its brethren over at Kingston’s official site.